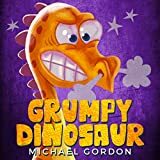 A little Dinosaur gets annoyed easily, sometimes for no reason at all! Simple rhymes, cute characters in adorable settings, and sweet, comforting addition to your child’s nighttime routine. Boy has a friend Dinosaur. Dinosaurs represent all the kids: when they want something, they go out and get it. Let’s be honest the Dino is having an ugly tantrum. Dinosaur battles against his friends, food and even grown-ups. This book contains colorful dinosaur illustrations. Lots of them. Enjoy these little sweeties, perfect alongside beautiful rhymes.